Well this first week of October has been manic! There were some huge improvements done at our home 'The Haven'. My very talented dad came over (I'd be lost without him)! And I'm thrilled to finally have a sink!.... It's been 3 months... (Washstand post further down the blog). He also moved the log burner from the dining room end, to the living room end. It's been great getting cozy in front of it in the evenings. I do wonder sometimes when any one room will be finished. I'm banking on the bathroom and I can't wait to show you around when it is! I've also been testing out recipes for Christmas. And working on some future blog posts, because as you can see, 'The Vintage Good Life' got new shoes! I'm so thrilled every time I look at the new design for the blog. 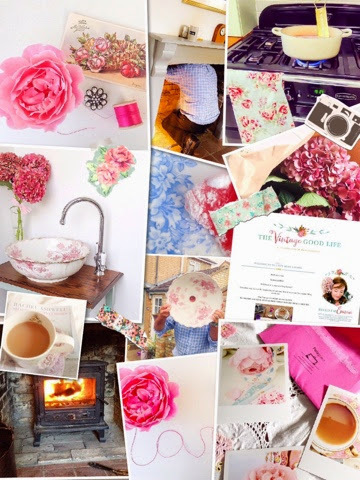 I want to say a huge thanks to Leanne from 'Brand Me Beautiful', for creating such a perfect space for my blog. And finally, if you haven't popped over to the about page yet, please take a look. There's a chance to share your creativity on the blog, and I'd love to have you.